LEN - www.lankaenews.com | Can you beat that ! The main actor in conspiracy to assassinate president melodrama is an officer receiving salary from president !! (Lanka e News -30.Sep.2018, 10.00PM) May we recall the assassination conspiracy against president Maithripala Sirisena which was splashed across the newspapers during the last several days was exposed by us as another melodrama orchestrated by the president himself . 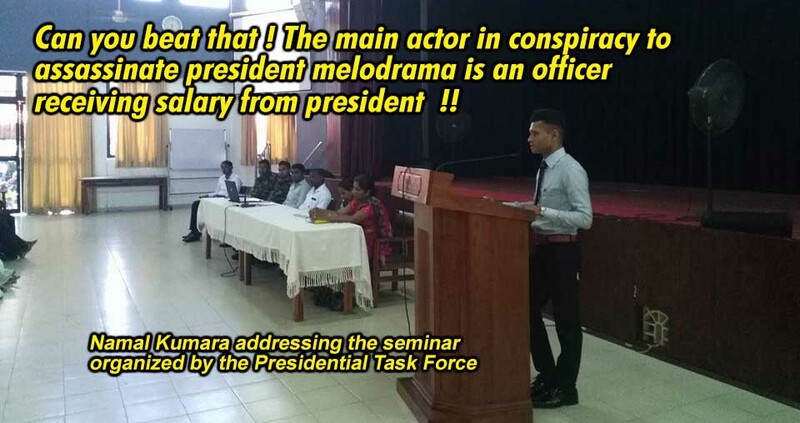 Now, after Lanka e news which always espouses and exposes the truth revealed the true position , it is confirmed that it is indeed a bogus stage show , and the actor playing the key role is none other than Namal Kumara who is receiving salary from the presidential secretariat. 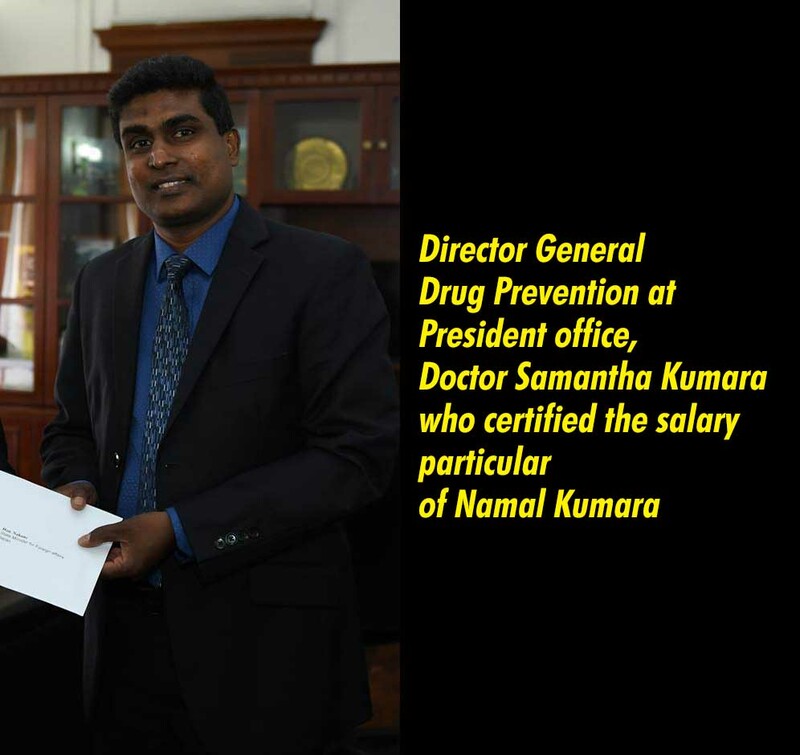 Namal Kumara is working for the ‘Presidential task Force on drug prevention’ which is under the president .The Institution which propagates the slogan ‘ a country free from drugs’ is being run by a doctor by the name of Samantha Kumara Kithalawarachi who calls himself as its director. Namal Kumara has recently applied for a loan from a commercial bank in Warakapola. Through that application he filled , his place of work and his employer’s details have come to light with evidence. In that application Namal Kumara bearing identity card No. 862322878V , has stated his employer is ‘Presidential task Force on drug prevention’ , presidential secretariat , Colombo 1. In further confirmation of this , it is Dr. Kithalawarachi aforementioned , the director of Presidential task Force who had certified Namal Kumara’s salary particulars and signed it. It is specially noteworthy this ‘Presidential task Force on drug prevention’ is functioning directly under president Sirisena and monitored by him. The most crucial question therefore is , if Namal Kumara who is directly working under the president was aware of the assassination conspiracy , why didn’t he immediately tell and warn the president as a loyal employee instead of making a huge din holding a media briefing and quacking like a duck in mud ? The chief speaker in the campaign ‘country free from drugs’ directly under president Sirisena is Namal Kumara. The photographs herein depict Namal Kumara making speeches during those programs. He established links with the police via these programs. Namal Kumara has also been supplying information regarding drugs to the Police . Besides he has been an activist of Bodhu Bala Sena and ‘Sinhale’ with the knowledge and consent of the president. The format of ‘Presidential task Force on drug prevention’ has transformed into a paramilitary organization to a great extent, and these are the scoundrels who were in the frontline stoking and fuelling the flames of the Sinhala –Muslim riots in Kandy recently with Sirisena’s patronage. These are the same villains who attacked the Ambathenna Vihara and set fire to it pouring petrol. It is the same scoundrels who launched attacks against Muslims in Ginthota ,as well as created mayhem in Amparai. It is interesting to note it was during the series of these violent incidents Sirisena and Gota the most notorious elusive criminal were having dialogue with a common villainous political agenda . Those attacks were launched with the primary aim to portray that the Muslims are being subjected to torment and trauma even by the UNP, and they were not persecuted by the Rajapakses alone. This publicity campaign was conducted by the notorious crooks and most corrupt Gammanpila ,Weerawansa and Dilan of the cesspit cabinet of Sirisena alias Sillysena , who are moving heaven and earth to promote and propel Gota another criminal villain into power. DIG Nilantha Jayawardena who is in charge of the Police State Intelligence Service (SIS) is eyeing the IGP post . His closest rival is DIG Nalaka Silva who is on par with him . When president Sirisena had disputes with IGP Poojitha , the former used Nilantha Jayawardena to achieve his goals. Because of this the president himself paved the way for a relationship build up between Namal Kumara and Nilantha . By now it has come to light to us , most of the taped recordings provided by Namal Kumara were supplied by Nilantha . It is a well and widely known fact the popularity base of president Sirisena has plummeted to a meager 4 %. Yet he is not prepared to retire from politics- a characteristic common to all politicians including Mahinda Rajapakse (nomerenna miniha) who have tasted the infinite sweetness of infinite corruption and are power drunk. In the circumstances , Sirisena has to negotiate with Ranil or Rajapakse in 2020. The UNP –Sirisena marriage is tottering with no possibility of a reconciliation .Hence the only option now available to Sirisena is lean on Machiavellian Rajapakse and negotiate a deal while eating rotten hoppers which Mahinda has in plenty to offer this time. The ‘group of 18’ opportunists was sent to Rajapakses as a preliminary step though the Rajapakses treated that group like chewed betel. It was proposed that Mahinda shall be made P.M. no sooner than Sirisena returns from New York , and as a reciprocal gesture , Sirisena shall be made the presidential candidate. However Rajaapakses have not agreed to that. It is in this climate and context , the fake ‘teledrama’ was staged to thrill and enthrall the Rajapakses. Based on that fake ‘teledrama’ Sirisena is to be assassinated via a conspiracy of Ranil , and the latter thereby becomes the ‘King’ . By this orchestrated drama what Sirisena is trying to drive home to Rajapakses is , if this crisis is to be averted , Rajapakses shall put through a deal with Sirisena . Of course , anyone can clearly see through this subterfuge and fathom what are the dastardly and diabolic aims when pressures are exerted on the Rajapakses by Weerawansa , Gammanpila , Dallas and Dilan the most notorious crooked political opportunists of the cesspit cabinet of Sirisena amidst these scenes of the fake drama. Sirisena who believes that ‘Raw’ was behind the arrest of the corrupt chief of his staff on bribery charges was for a long time waiting for an opportunity to hit back at India . Marseil Thomas who was enlisted by Namal Kumara for the Sirisena conspiracy is an Indian national from Kerala. In 2017 he came to Sri Lanka on a tourist visa which expired here. Namal Kumara is most famous for using the close relationship he had with Nilantha Jayawardena and Nalaka Silva of the police to get criminals facing charges to escape from the arms of the law and flee after collecting kickbacks. The Indian national too came in search of Namal Kumara seeking assistance .He had need to save himself from the police because he had no valid visa. What Namal Kumara did was exploited the situation weakness and entangled the Indian national on a well calculated plan in the assassination conspiracy . The sniper weapons which were with the Terrorist investigation unit do not belong to the inventory of police weapons. These were weapons smuggled to the South during the notorious Mankulam withdrawal operations and those were taken into custody from the house of a deserted member of the forces. It is a common saying , a policeman is one who sells even his mother .When probing into the activities and affairs of Nalaka Silva it has come to light he is a fox that devours both sides , and a byword for worst treacheries. If frauds , robberies and treacheries are an art and drama he is ‘Shakespeare Sirisena’ . Sadly however , his teledrama using Namal Kumara as key player courted disaster and defeat. Former State Intelligence Service officer.